It was in the 1890s when the electronics industry was witnessing growth, and Gerard Philips was experimenting with carbon filaments. Then in 1891 Frederik Philips, Gerard’s father financed the purchase of a factory in Eindhoven to make and sell electric incandescent light bulbs. They began with carbon-filament lamps and then expanded all over Europe. They won large orders in Russia, including one from the Tsar to light up the Winter Palace. Philips became a limited company in 1912, and in 1918 they introduced a medical X-ray tube. This marked the beginning of their diversification. During this time Philips expanded to countries like Brazil, China and Australia too. In 1927 Philips began manufacturing radios and sold one million units in the next five years to become the world’s largest manufacturer of radio tubes and radios. By 1939 they had launched their revolutionary product, the rotary electric shaver – Philishave. In the coming years, they delved into medical research, integrated circuits, transistors and transmission of television pictures. Philips introduced the Compact Audio Cassette in 1963, leading to the invention of the Compact Disc or CD between 1970 and 1980, in partnership with Sony. They again partnered with Sony to introduce the DVD in 1997 which became the fastest growing home electronic product in history. Read our latest guide about the best AKG headphones. wants. However, Philips does offer the best value in terms of quality and price. These are the most audiophile earphones and offer a dynamic sound with greater long-time listening comfort. The buds go inside the ear and stay there due to the air seal. The over-ear earphones, cover the whole ear, blocking out the sounds around, leaving the listener to focus on the sound in the earphones. These are over ear earphones but with a mic attached. Generally used to make or take calls, without the hassle of holding a phone to the ear. The wireless earphone does not have any wires attached and can be connected via Bluetooth. They are in the ear that is the buds go slightly inside the ear canal. 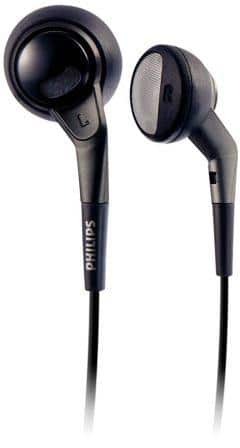 Many of the Philips earphones can be connected with Bluetooth devices for wireless music enjoyment. Some brands promise wireless connectivity but don’t work that well in reality. This does not happen with Philips. The earphones easily connect with a Bluetooth device and allow a great wire-free experience. The button on the earphones allows one to control music, calls or the volume. No depending on a phone, just press the right button on the earphone, and you are good to use. open acoustic design that allows one to be aware of the surroundings and stay safe. While working out or running, it is good to be aware of the environment, so the sports series considers that and lets the user hear what is in the vicinity. The Philips earphones have clear sound quality and powerful bass providing an all-around user experience. The earphones are competitively priced and will fall under most budgets. The ear cushions are soft and breathable, adding comfort to long listening sessions. They fit the head snugly without creating discomfort for the ear. There are plenty of earphones in the market, but not all of them have soft ear cushions. Using them over a long period may cause pain and discomfort on the ears. But the ones by Philip are soft and ergonomically designed. The earbuds and ear tips come in different sizes for the right fit, so that small ones don’t fall off ears or large ones don’t cause discomfort. The rubberized stability ring in the earphones allows a secure fit. The cable and connectors attached to the earphones are reinforced for durability. Many of the sports versions have strong cables so that any kind of pressure doesn’t damage the product. They are also tangled free and are designed to be ready for use. Read out complete guide about the best skullcandy headphones. when listening to something for a long period. The in-ear and over ear earphones are made to be used over a long period, so they are designed with comfort in mind. If one has ever owned a Philips product, they will know that it doesn’t get damaged or spoilt easily. They are built for durability and last long, considering most electronic products need frequent upgrades. Philips has been a trusted brand for consumers. A lot of people have grown up with Philips devices around like cassette tapes. The advantage of a 100-year-old Company is that it gets sufficient time to build trust among consumers. And Philips has managed to do that. The brand has a good following and quality products, due to which their products are still bought. Philips can definitely hold its own in the electronics or earphones market. 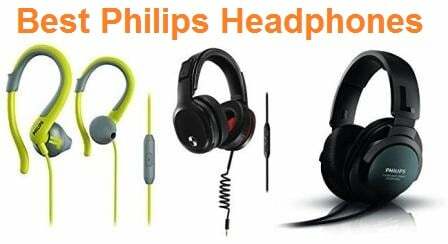 Below are some of the best Philips headphones and their key features explained in detail. 4. Philips BASS+ On-Ear Wireless Bluetooth Headphones with Mic – Black. over-ear earphone with memory foam cushions. The 50mm drivers reproduce all the dynamics of the sounds and also deliver that crisp bass, clear high frequencies and clear mid-range. The open-back acoustic architecture removes air pressure to produce the pristine audio. The Layered Motion Control (LMC) drivers deliver precise, crisp sound while the pre-tilted ear shells give an unadulterated sound performance. The hammock is lightweight, self-adjustable and flexible. The ear cushions are breathable velour cushions that dispel heat and pressure. It has a cable management clip to ensure they don’t tangle. The Philips Fidelio X2 has 50mm neodymium drivers that use an excellent multi-layered diaphragm technology. This gives a transparent treble and a cleaner accurate bass response. The sound transparency and smoothness are enhanced by the open-back architecture. The Layered Motion Control drivers form a flexible boundary to absorb exaggerated frequencies. The shells tilt at the 15 degrees to fit an ear perfectly, channeling the sound directly to the ears. The hammock is adjustable and comes with a 3D mesh to provide you with the utmost comfort. The ear pads are made from deluxe memory foam and velour to allow breathability and dissipation of heat. The Philips Fidelio X2 has a 3.5 mm plug and is wired. It also has a detachable cable connector that can be used. The ear shells are double layered and made to reduce vibration and resonance to bring forth flawless sounds with detail and precision. The layered, solid make ensures durability. The earphones are high-quality products and will last for a good time. Each speaker is tested to produce natural sounds. The neodymium magnets in the driver reproduce the music dynamics to deliver a crisp and balanced sound. The acoustic open-back construction provides for audio fidelity. The LMC drivers smoothen out exaggerated frequencies, and the pre-tilted drivers fit the ears for minimal sound reflection. The earphones have high-resolution audio quality. The hammock and ear pads sit comfortably on the ears. It produces high-resolution sound quality and smooth sounds. Comes with studio adapter, and also offer great deep bass. The earphones are heavier than most of its counterparts. It has not been suggested for travel as sounds leak in and leak out. Open-back design allows outside noise in. ear Headphones are a right fit for you. The headphones will perfectly blend in with all size of ears and will give you the added cushiony comfort to your ears. With the cable extendable to the length of 1.5 meters, you can easily groove to the music, or roam around in your house wearing these super amazing headphones. If you have trouble with the chords of other speakers, breaking off in some time, then don’t be. These headphones have got a thick chord with the jack size of 3.5 mm on both the sides. Looking at the price of these headphones, the built quality is pretty good and durable. The head pads are really thick. 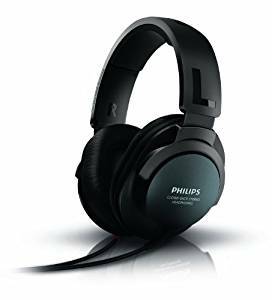 If you take a look at the Philips SHP9500S HiFi Precision Stereo Over-ear Headphones, you will find that the design is similar to the vintage headphones, with a perfect minimalist modern touch. On both the sides, there is a right and left mark, for simpler identification. The jack on both the sides of the chord is around 3.5 mm thick, that can be easily connected to any other device. The major plus point because of this thick jack space is that you can plug in any chord. 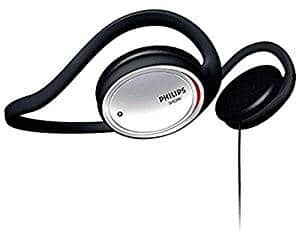 The Philips’ headphones are way too durable because of the steel material that they are made of. The padded cushioning won’t wear off easily even with daily use. The headphones have the feature of the open-back architecture, which is why there is immense movement. This intensifies the smoothness in the sound quality and does not make the sound scratchy during high pitched music. The bass is pretty impressive as it creates a perfect balance between tone, treble, and bass. A steal at a low price. Utmost comfort with the cushiony and leather ear pads. It is amazing for gamers. The bass quality in mid sound pitch is not that great. The ear pads become sweaty and are not detachable. 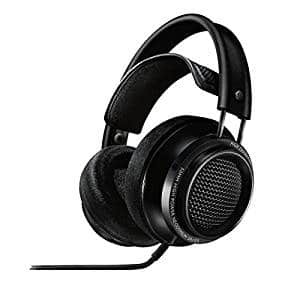 Headphones with Mic and Memory foam cushioning headphones are an amazing buy for you. With the feel of a high-end headphone, these headphones will provide you amazing quality music and that too without burning a hole in your pocket. While unboxing, the headphones will be provided to you in a pouch, with a remote and mic. There is a 6.3 mm adapter as well. The best part about these is that you can even use these headphones in public as they will provide you complete isolation in terms of music. Here, read through detailed features of the headphones. The headphones will give you a feel of high-end ones in the market. With the headphones covered under the leather material in some dark colors, there is red stitching all around the headphones. This gives a royal yet minimalist feel to the headphones. For the purpose of connectivity, the headphones have got a 6.3 mm adapter. The speakers are immensely vented and have got neodymium speaker drivers, that have easy connectivity. The speakers are made out of aluminum caps that will hold the headphones together for years. You can easily carry your Philips L2BO/27 Fidelio anywhere as they are easy to store and takes comparatively less space. The sound quality of these headphones is amazing. The headphones have got treble that is very sharp and crisp. For all the acoustic lovers, the sound quality is balanced at the right amount. The cherry on top of the cake is the imaging quality. The mids are very well ranged. The sounds of both male and female sound extremely good through these headphones. There is the utmost comfort in these headphones. The bass is perfectly balanced, and the treble is crisp and sharp. They have pondered over little details of the headphones. There is a lot of pressure on the headband. The midrange of the music might sound a bit lean. headphones? 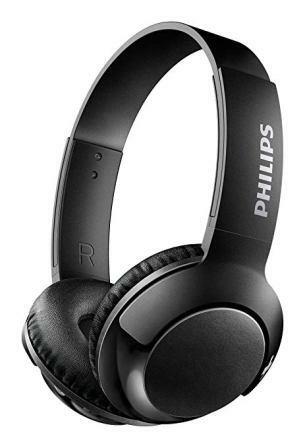 Then Philips BASS+ On-Ear Wireless Bluetooth Headphones with Mic – Black should be your go-to option. These Bluetooth speakers have isolated sound quality and well-balanced bass quality. Well, the Bluetooth headphones are a fad in the market, and these are the winners. Lasting for 12 hours, there won’t be a need to look for the plug point for charging now and then. The best part about Philips BASS+ On-Ear Wireless headphones is that it has got control buttons on the right side of the headphone. With just a click you can easily control your music on the go. The headphones are foldable and can be kept in your travel luggage easily. The ear pads are built out of big cushions, that will provide you utmost comfort for long. The auricles are rotatable, and you can fit them conveniently according to your choice. The headphones are connectable to any device by way of Bluetooth technology. The Bluetooth connectivity ranges till 10 meters. The headphones are made out of strong material that can be held for a long time. The foldable specification is pretty convenient and won’t damage the headphones in any way. If you are on a lookout for budget buys, the sound quality of these headphones will surely impress you along the way. The bass is amazing. Although you might be disappointed with the sound isolation feature of the headphones. There is not much of sound isolation. A competitor in the market for the budget buys. The sound quality is pretty amazing. The material is not that sturdy. There is no indicator light for switching on or switching off the headphones. The light turns on after every 8 seconds. love to listen to music with loads of static force. The headphones have wired connectivity with 40mm drivers. Philips is one company that guarantees that their headphones can sustain high static force generated through high volume music. These headphones stand up to the claims given by the company. Keeping in mind the comfort of users, the headband is adjustable and does not exert too much pressure on the head. Along with that they are made out of really soft fabric, to avoid the stress. These headphones are really sleek and light to carry while commuting from one place to another. They are designed to fit into the modern day world. To kill the noise from the outside world, the headphones are not made out of the open-back design. The wired connectivity in the headphones is because of the 40 mm drivers in the headphones. The headphones comprise of built-in-microphone feature so that you can easily answer calls while using the headphones. The headphones are a way to sturdy and reliable. As promised by the company, the headgear can stand the static force of 1.5 tons. On the sides of the ear, cans are the metal rings that are good at sustaining the hard impact of the music. The bass of these headphones is immensely good. The electronic music lovers will surely enjoy this experience. Since the headphones do not have an open-design system, there is complete sound isolation. The only thing is that the devices that are connected to the headphones have a big impact on the sound quality generated from the headphones. They are able to sustain high impact music. The headphones are really sturdy. The controls are there on the headphones. The sound quality takes a toll on the basis of the device connected. The material of the ear cans is not long lasting. mm neodymium technology that will let you hear music without any obstruction. These wired speakers, come with a chord that is 1.8 mm long, convenient for easy movement. The ear cans are made out of the leather material that is extremely padded and can be adjusted according to the ear fits. The headgear is adjustable and can be worn for long hours without putting on too much pressure on your head. The sound isolation completely blocks all the noise, so that you can listen to your music without any interruption. Available in dark colors, the headphones seem like they belong to a high-end brand. The headgear is adjustable and can be molded according to your needs. The ear pads are way too cushiony, and they can be worn for long without any discomfort. The design is edgy and looks really fashionable, a perfect choice for style conscious people. The connectivity of the headphones is wired. It has got a long 1.8 mm chord that can be utilized for easy movement. However, if you want to dance to the music, the headphones are not a good fit for you because of the chord. The speakers are very durable and are made out of heavy material. The ear pads are made out of good leather material that does not get damaged easily due to continuous wear and tear. The bass quality of the headphone is well-balanced. There is complete isolation of the sound, so there is no presence of noise. However, these are not a good option for studio purposes. The bass sound is amazing and is a steal deal at such a low price. There is complete isolation of sound. The headphones feel too bulky. The ear pads are not that cushiony. Are you always tangled among the wire of your headphones? Here is a chance for you to get out of the mess. 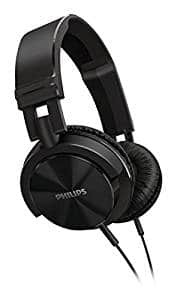 Philips SHS390 On-Ear Stereo Headphones (Black) comes with the one-sided chord, that won’t allow you to get tangled again. The ear cans of the headphones will cover up your ears completely and will provide you with a surreal experience for listening to music. The 3.5 mm jack of the headphone will give you the independence to connect the headphones to any other chord. The chord length for connectivity purpose is 1.2 meters and gives you the independence to move freely. The ear cans are made of soft cushions that provide utmost comfort to you while you groove to the music. In terms of design, these headphones really stand out in the market. With super sleek design and silver ear cans, makes these headphones simply alluring to the eyes. The design that is super sleek is good for users to have a strong grip over the headphones. The headphones have wired connectivity with a one-sided chord of 1.2 meters. The connectivity jack is of 3.5 mm and can be inserted with any other cable. The headphones might look too delicate with the design. However, the headphones are way too durable for the long run. The bass of the headphones is well-balanced, and the treble is just amazing. In addition to this, you can use different equalizers to manage the bass as well. The treble is good for electronic music lovers as well. The ear cans are cushiony enough for long hours. The chord is one-sided, so there is no problem of getting tangled in the chord. You can not lie down wearing these headphones as they will come out of your head again and again because of the design. The sound impact is too intense. 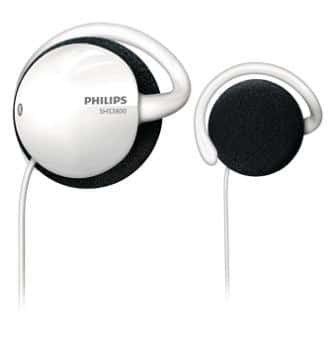 popular choices for over the head earphones is Philips SHB6250/27 Bluetooth Wireless headphones. These headphones are the ultimate go-to headphones for any sort of travels and activity purpose. Enjoy the refined sound quality and rich bass without the mess of tangled wires. The slim and portable headphones have Bluetooth to help you stay connected to your favourite music on any of your devices. 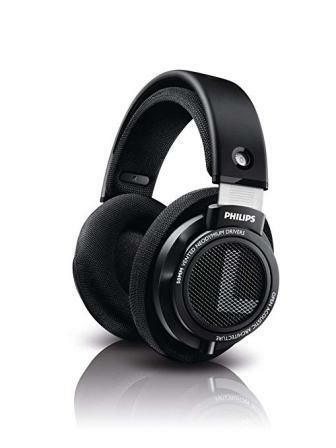 In terms of the design of these headphones, Philips SHB6250/27 Wireless look sleek and stylish. The headphones are only available in black color and look sharp yet minimal and are also lightweight. For the utmost convenience and unwired freedom, Philips SHB6250/27 comes with Bluetooth technology and excellent wireless control. You can pick calls, make calls and also activate Google Now and Siri through your headphones. The Philips’ headphones have adjustable headbands and ear shells for the perfect comfort and fit. These durable headphones also have a foldable design for quick and easy portability while travelling to places. The Philips SHB6250/27 wireless headphones run on 40mm neodymium drivers for clear sound and deep bass. Also, the 1-tap NFC connection for easy pairing helps you connect to various multimedia devices on the go. Can be easily connected on the multimedia devices. Easy to store with no specific bulk. The quality appears to be cheap. you. The headphones come with a 3.5 mm jack and are wired with a cable length of half an ft. The over-the-ears headphones will give you utmost comfort and has got a single chord that is convenient for movement. Available in one size, it is a perfect fit for people of all head size and won’t burn a hole in your pocket. 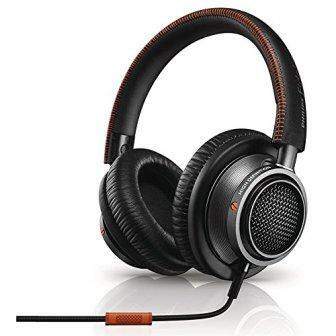 The best part is that you can use them on a continuous basis and there will not be any wear and tear of the headphones. If you are someone who is not involved with deep bass, then this headphone is surely a catch for you. The headphones are available in dark colors and have got leather fitting for ear cans. The ear cans are quite cushiony. The headgear exerts a lot of pressure and is made out of heavy plastic material. The headphones can be connected to any device using a side-chord of 1.2 mm in length. The chord can fit inside the jack of 3.2 mm. The headphones are way too sturdy and can last for years. The headgear is although made out of a plastic material. Still, it will last for long. The ear cans have got an outer covering for extra protection. The sound quality is good, but it is not an ideal option for the good bass quality feature. The sound isolation is not as expected, but it can control the external noises to some level. However, the sound is pretty clear and sharp. They are way too sturdy. The plastic of the ear cans gets chipped off over time. The bass is not that good. It is not comfortable for a longer duration of time. (SHQ1255TLF/27) will be a good buy. This microphone headphone is available in neon shades and can be used conveniently while exercising or jogging in the park. The microphone headphone provides a lot of stability and fits well inside the ear. Keeping in mind the comfort, it has got good cushiony, rubber earbuds. These headphones fit perfectly in the ears and have no extra weight. 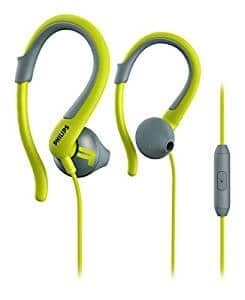 While the users are working out in the gym, hung on to the headphones, these headphones won’t fall out from the ears. The bass is extremely well off. With a super sleek and lightweight design, the headphones are your best bud while you are working out. The inner earpiece is made out of rubber and is really comfortable. They have inbuilt mic system as well. The headphones can be connected to any device by using the wired connectivity with a 3.5 mm jack. With the inbuilt microphone, you can easily control your phone calls. These are very delicate in nature and are not that durable for the long run. The chords are too thin to go on for long. However, the earpiece can sustain any fall and can be good for the long period of time. The sound quality is amazing. The bass is extremely good. There is no interruption of the outside noise. As the headphones fit perfectly in the ears, the sound interruption is not much. There is complete sound insulation. There is complete sound insulation. The design and the color are really funky. The headphones are way too comfortable in the ears. The headphones are not a fit for ears of all size. They do come off easily especially from small ears. The rubbers allow them to glide easily. clip feature, they will easily cling onto your ear and will be super comfortable. 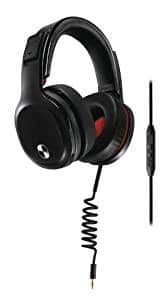 The plus point of the headphones is that it has got bass vents, for the easy movement of the sound, so that the sound quality is crisp and sharp. Coming to the comfort quotient of the headphones, the ear pads are comfortable as they are made out of foam that is really thick and it is always stuck behind your ear. So, there will be no trouble with the headphones falling out all the time. The headphones are super sleek and are handsome looking. The clip-on makes it stand out in the market with other brands. The ear cans being of silver color, add in the bling in the headphones. The earphones clung onto the backside of your ears. The headphones can be connected easily to any device and have got a chord system. The cable is 1.2 mm long, and the jack is of 3.5 mm. The headphones do not look like they are too durable but they last longer. The chord of the connection is really thick, so there is no fear of damaging of the chord as it is made of copper material. The ear pads are really soft and are made out of thick material that is super comfortable on the ears. The sound is really good, and the bass is highly impressive. There is a lot of sound travel as there are bass vents, so the sound quality is sharp and crisp. The ear clip on is a good option if you are working out and wearing these headphones. The design is super impressive. The beat vents are the best feature. The earpads do not last long, either one dies. The jack of the headphones is not durable and dies off shortly. focusing on the work you are engaged in. With a number of specifications, the headset helps in continuing your work without reducing the motivation levels. The sound system keeps you engaged that you would barely know about your surroundings. Colored in white, the in-ear headset comes in an ergonomic design with utmost slim caps properly rubbered that adds comfort in a long time listening. Again, the integrated design of the headset comes with an accurate microphone along with a call button that improves your listening experience. 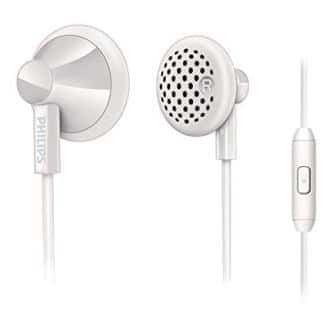 The headset is also given a 3.5mm plug that makes a connection to handsets like Sony Ericson, Samsung and Nokia possible. Coming to the connectivity of the headset, the cable connection is designed with two-parallel and symmetric cables that length 1.0m. The connector stereo is of 3.5mm made out of copper material. Lastly, the finishing of the connector is plated with Chrome given an in-built specification. This in-ear headset by Philips is given a cable clip along with a protective pouch which adds to its durability. There is also a reflective stopper provided in the cable while the headset is rainproof and sweat resistant too. The sound features of this white headset which allows the listeners with the bass beat which not only provides with improvised sound but also allows the movement of the air for a deep and rich bass experience. The sensitive microphones make it easy for the user to control the talking on the phone. Easy to carry around in your school bags, handbags, etc. The sound quality is just okay, not that great. headphone and microphone. With high-quality sound, the headphone comes with utmost comfort to the ears no matter wherever you travel. Whether you remain indoor or move out, you are sure to carry them. Available in black color, it adds to the stylish look for the music rockers. The design of the Philips O’Neill Crash headphones is given a dual-purpose zone providing with utmost comfort. The user can enjoy thrilling music through the noise-isolated leather framed cushions that provide relaxation to the ears while using it. Again, when not in use, you can also slide down the headphones to your neck without hurting your chin. The headphone is also given an in-line remote system that makes switching to music and calls easy. The connectivity of this headphone and microphone combination by Philips comes with cable connections designed in the single-sided cable. The connector is provided with a 3.5mm shape which is given a finishing of gold plating. The length of the cable is 1.2m while it is made out of oxygen free copper. This amazing musical instrument by Philip comes with one year of manufacturer warranty. Again, the tough fabrics and other materials used in its formation and the metal cabinet add to its long-term time period. O’Neill Crash is provided with 40mm neodymium drivers that provide the user with high-quality sound experience. The headphone is also given acoustically tuning for deep bass sound adding to the clarity of the sound. Ear hook Headphones is what would satisfy you the most. As the name suggests, the headphones are given the shape of ears which are flexible enough to fit anyone’s ears easily. The stylish headphones are available in two beautiful colors, pink and white. As the name suggests, Philips has provided a quite flexible ear hook design which is sure to fit nearly all the ears with ease. The ergonomically designed headphones increase the comfort levels by increasing the stability and comfort of the user. The design of the headphones makes it easily supportive to the iPhone, iPod and other MP3 players with ease. The headphone is given a connector of 3.5mm which is later plated with copper. The impedance of the headphones is 16Ohm while the length of the ear hook cable is 3.9inches. The maximum power the headphone can be used with is 15mW. The headphones provide you with a warranty for one year. The headphone is given an ergonomic design which makes it more durable and comfortable for any size of ears. Just as the headphone provides with 3D flexible ear hook, similarly, it works amazingly on the sound through a bass pipe that provides with realistic and clear sound on both ends during the call. The design of the ear hook adds in getting the best sound to your effectively. Through the advanced bass pipe feature, the headphone helps in increasing the mind towards the low tones for giving you a clear sound. Philips is something that would attract you the most. With wired connections, the headphones are given dual vents that support sound quality which is well balanced. The headphone is available in the best and stylish color, black. With the extra bass feature, the earphone gives balanced sound too. As the name reveals, the in-ear headphones are given a fit to ear design with neodymium speaker. The headphone is given twin channel with flexible connection with the cable. Again, the earbuds are given proper cushions that add to the comfort of using the headphone. The cable connection is given both two parallel and symmetric connection. The length of the cable is 1m while the connector comes with 3.5mm with nickel plated connector finishing. The cable is made from copper metal too. Coming to the durability of the earphones, they are given durable, flexible grip design. The padded cushion earbuds provide with utmost comfort not allowing a single space to the music to slide out. Again, the earphones are given one year of manufacturer’s warranty too. For providing you with the best sound experience, Philips has designed this earphone with dual or say extra bass. The twin vents also provide you with a balanced musical experience along with bass tones. The ears are given 15mm speakers that also provide you with surrounding impact while listening to the music.